Specially designed to provide smokers with a more sophisticated smoking experience, these RAW x RooR Slim Glass Roach Filter Tips are strong and durable, and a joy to use. A collaboration between smokeware companies RAW and RooR, these glass filter tips are the slimmest on the market and are hand blow using quality German Schott glass. Measuring in at just 5mm thick and 31mm tall, the RAW x RooR Slim Glass Roach Filter Tips feature internal dimples specially designed to stop unwanted deris form going into your mouth. 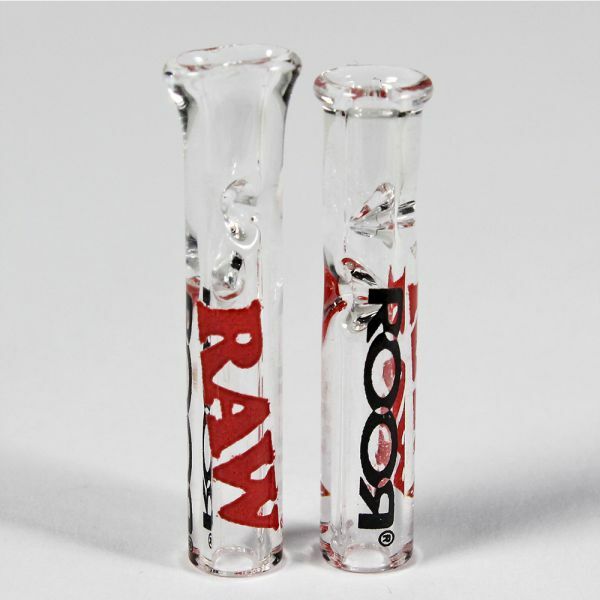 RAW and RooR branding completes the sophisticated look, and they also come with a re-useable plastic jar to store the filter tip in when not in use. Available with either a flat or rounded tip, these glass filter tips are available for £6.99 each or 2 for £12.99. If you’re looking for a strong and durable re-useable filter tip, then look no further than the RAW x RooR Slim Glass Roach Filter Tips.